LANSING, Mich.— State Sen. Dan Lauwers was sworn in as senator of the 25th District on Wednesday during a ceremony at the state Capitol. Michigan Supreme Court Chief Justice Stephen Markman administered the oath of office. 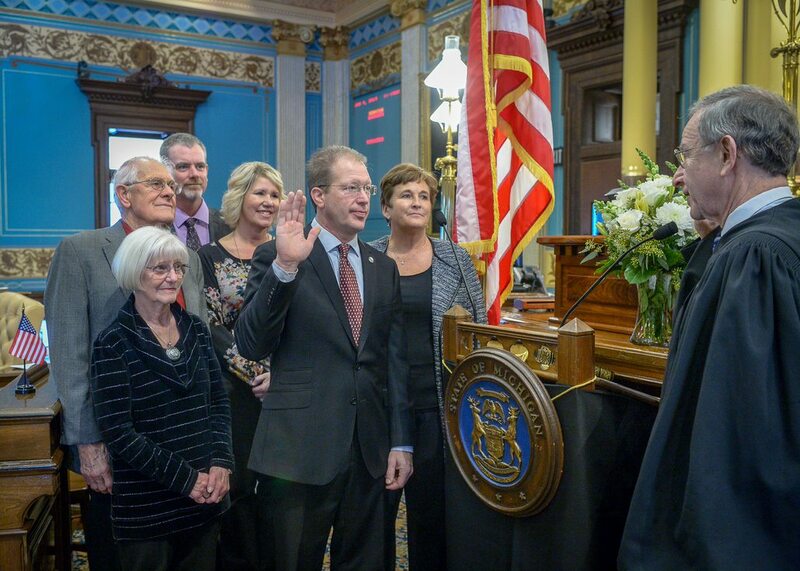 Lauwers was joined in the Senate chamber for the occasion by his wife Kellie, parents Richard and Mary Lauwers, and sister and brother-in-law Anne and Tom Leen. Lauwers’ office is located in Room S-2 of the state Capitol in Lansing. Residents may contact Lauwers by phone at 517-373-7708 or toll-free at 1-855-347-8025, by email at SenDLauwers@senate.michigan.gov, or via U.S. mail by writing to Sen. Dan Lauwers, P. O. Box 30036, Lansing, MI 48909. More information about the senator will be available at his forthcoming website at www.SenatorDanLauwers.com. The 25th Senate District includes Huron, St. Clair, and Sanilac counties as well as Armada Township, Memphis, New Baltimore, Richmond and Richmond Township in Macomb County. Editor’s notes: The above photograph of Lauwers is available by clicking on the image. It will also be available at the senator’s website at www.SenatorDanLauwers.com/photos. A video of the swearing-in will be available at www.SenatorDanLauwers.com/video.